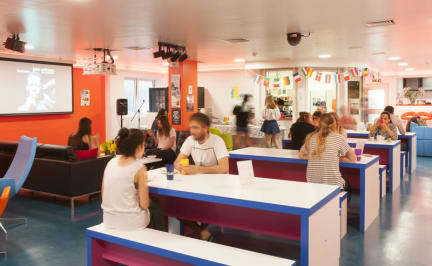 SoHostel is London’s newest and most central hostel for travellers seeking comfortable but affordable accommodation. We offer we offer stylish, clean and secure accommodation for single travellers, couples and groups. Our large range of rooms will suit everyone’s needs and budget. From 6-bed dorms to rooms with access to shared bathrooms, and our brand new rooms with private en-suite bathrooms, there is something for everyone! Breakfast is available on-site along with 24 hour vending for your midnight cravings. Bed linen is provided and towels can be hired at a surcharge. Washing and drying laundry facilities are available. 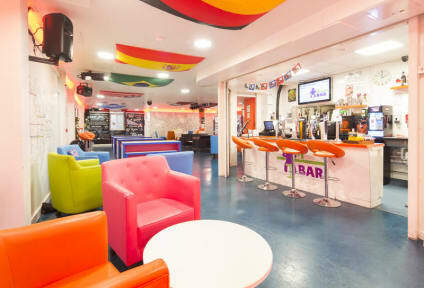 Guests can relax in the shared TV lounge, or have a drink and make new friends at the onsite bar and enjoy our happy hour with half price drinks or daily special cocktails along with live music, karaoke nights and more! Payment upon arrival by cash, credit cards, debit cards (except American express). Everything was perfect there. The hostel is very organized, the staff very helpful and friendly, the rooms are good and there were a lot of bathrooms and showers. I would recommend to everyone! So this was the first hostel I ever stayed and they set the bar super high. Their staff is super friendly and engaging with you when asking questions. The moment I arrived there I loved it. They have a key card system which gives you a strong sense of security. Not only that but they give u a large suitcase size metal chest which slides under ur bed. All you need is a padlock. Their breakfast is insanely good. Breads of all kinds, different types of milk, fruit, jam, cookies, EVERYTHING. This hostel had everything I needed and more. The pamper room was amazing to do makeup in. And the facilities were all clean. The only issue was that even with happy hour the guests Did not socialize. The employees at this hostel were very nice and courteous. The facilities were clean and tidy. The only problem I had was lack of sleep due to the noise outside. The hostel is located right next to a gentleman’s club, and the people outside got pretty rowdy and obnoxious at late hours of the night. Aside from that the area is fine and very convenient and accessible. This is my first trip to London and the location was great. Close to subway and could walk anywhere. Would recommend this hostel to any new travelers. I found it easily and the staff are great! Good hostel. The bar can be really noise at night. They dont have a kitchen and the space to left the stuff in the dorm its to small. Staff was great and the location it’s perfect.